Indian steel producers may in the near future face serious problems connected with the drop in value of the Russian ruble. It became more advantageous for local consumers to purchase Russian goods instead of Indian ones. Indian steel producers are watching the drop in the value of the Russian ruble with increasing concern, according to Bloomberg new agency. 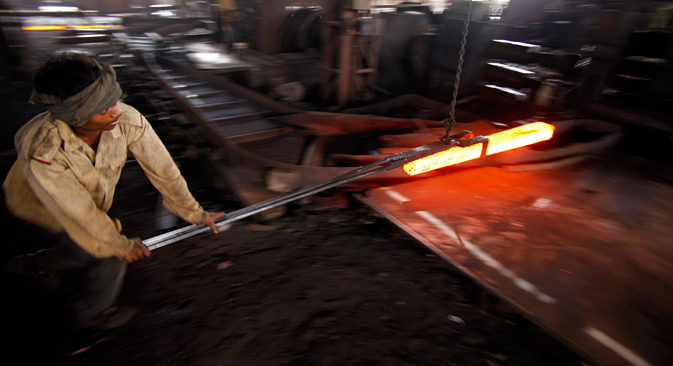 The hopes of India’s leading steel companies that an Indian government program to speed up economic growth, to lead to increased sales volumes of Indian steel, are unlikely to be quickly justified – following the drop in the ruble’s value comparative to the dollar, it is more advantageous for local consumers to purchase Russian goods. “In the past month or so, deals have been struck for steel imports from Russia,” said JSW Steel’s Mumbai-based Senior Vice President Sharad Mahendra. He believes that the number of such contracts will only increase. India’s position on the international market is also under threat. Experts are certain that traditional foreign buyers of Indian steel, mainly Middle-Eastern countries, may well conclude contracts for Russian steel, especially as sanctions imposed against Russia have noticeably reduced demand for Russian goods in the West. The increasing activity of Chinese steelmakers on the Middle-Eastern market only exacerbates the situation. According to analyst Niraj Shah, who specializes in the Russian and Indian steel market, Russian companies now have the opportunity to offer discounts on hot rolled steel, for example, which Indian companies sell for $550–600 per ton. According to Shah the first Russian steel will arrive in India by February. According to information from the World Steel Association, Russia is the fifth largest steel producer in the world. India is the fourth largest steel producer, while China is the world’s largest producer. So far Indian companies are not talking about the possibility of reducing their prices, however experts are not ruling it out as necessary to protect their position. “Local steel producers will have to reduce prices if they want to sell their products,” said A.S. Firoz, a senior economist in the research department of India’s Ministry of Steel. He said that by next year India may have gone from a steel exporting country into one which is solely importing steel, and the weakening of the Russian currency will only strengthen this trend.